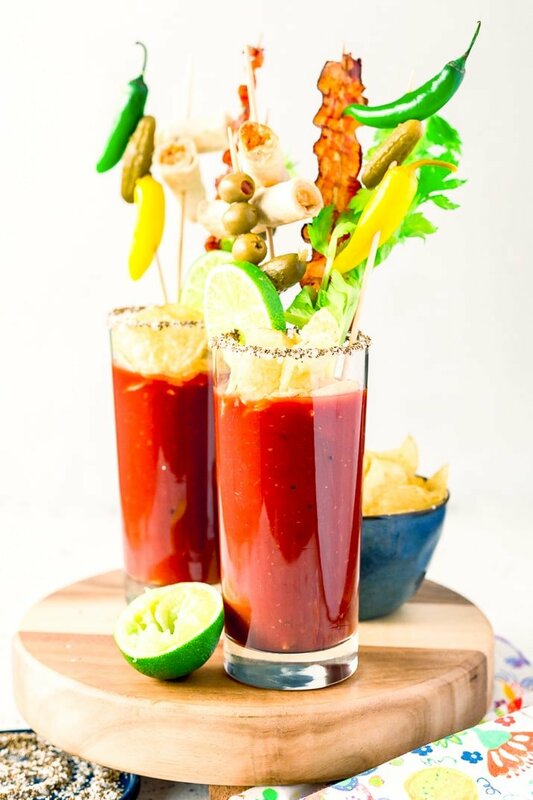 This is the Best Bloody Mary recipe made with vodka, tomato juice, spices, hot sauce, Worcestershire sauce and other delicious ingredients! Perfect for weekend mornings and brunch with friends! 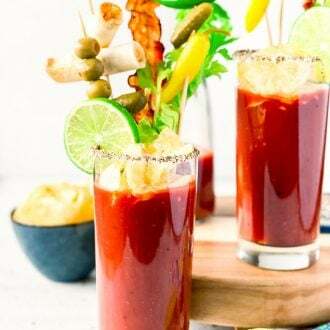 If you’re a “brunch-o-holic” like me, you have to try the Best Bloody Mary recipe to sip alongside your bacon and homefries. It should come as no surprise that I love cocktails of all kinds, but sometimes, something on the savory side is just what the doctor ordered! This is called the Best Bloody Mary recipe for one reason: it really is the best! Of course, this yummy brunch cocktail is made with traditional elements like tomato juice, Worcestershire sauce, hot sauce, lime, and vodka. But there are a couple “secret ingredients” in this mixed drink that makes it truly delightful. The first is jalapeno-infused vodka, made simply by steeping the sliced peppers in the alcohol. Trust me, the extra kick of spice will definitely give you a wake-up call! The second twist in this recipe is the addition of pickle juice! That’s right, a quarter cup of this stuff adds sour, salty flavor that tastes so good when combined with tomato juice. Lastly, this beverage is served in a highball glass with a celery salt-coated rim for an extra dose of savory goodness. Then comes the fun part — giving it your own twist with garnishes! If you’re hosting Easter brunch this year, you should definitely consider making a batch of these spicy cocktails. One of my favorite crowd-pleasing ways to serve them is by setting up a Bloody Mary bar for guests to add their own garnishes and munchies! This is an easy way to really impress your fellow drinkers. Supply a pile of skewers and have guests deck out their brunch cocktails with celery, olives, bacon slices, pepperoncini peppers, pickles, lime wedges, jumbo shrimp, even fresh herbs like cilantro and basil. Of course, no bar would be complete without a variety of craveable snacks to pair with these yummy mixed drinks. Some of my favorites include kettle chips, mini taquitos or tacos, and roasted nuts. Keep a stack of appetizer plates handy and let everyone serve themselves, mingle, and be merry! The other thing I love about this Best Bloody Mary recipe is that it only takes about 15 minutes to prepare. This means that your “best” morning cocktail doesn’t have to be saved for special occasions; you can whip one up on a lazy weekend morning at home, fancy garnishes optional! Also, I highly recommend sipping one of these alongside savory breakfast food like home fries, ham, bacon, eggs, or quiche. 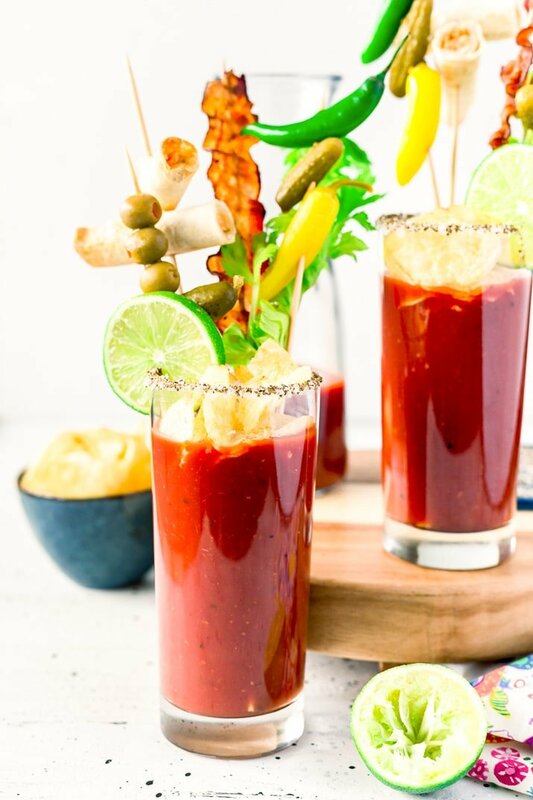 Whether you’re a Bloody Mary fan or you’re just craving a drink that’s savory and satisfying, this recipe will become one of your favorites. Did you know that the Bloody Mary was invented in Paris? Yep, in Harry’s New York Bar by Fernand Petiot in the 1920’s. This is the same bar the French 75 was created in a few years earlier. The New York Bar was popular among American expatriates, tourists, and soldiers and so while it may have been a Parisian bar, many of the drinks that came out of it were American inspired, like this one! Even though this cocktail recipe looks a little over the top, it’s not all that hard to make, but will take about 15 minutes to prepare. You can complete steps 1 and 2 ahead of time, even the night before, to save on time! Double, triple or quadruple for large groups! Begin by combining the vodka and sliced jalapenos and set aside to steep. Next, combine the tomato juice, pickle juice, Worcestershire sauce, hot sauce, lime juice, and black pepper in a small pitcher and stir gently. Adjust seasoning as needed and place in the fridge until nice and cold. When ready to serve, rim each glass with a lime wedge and dip into the celery salt. Divide the vodka and jalapenos between two glasses, then pour the bloody mary mix over top and stir gently. 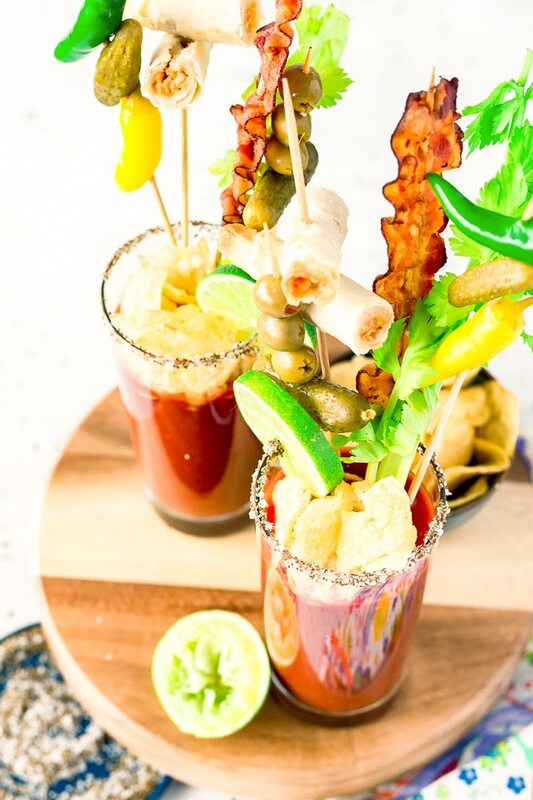 Garnish each drink as desired with crispy bacon, celery, olives, pepperoncini, kettle chips, and mini taquitos or tacos. Enjoy! Pin this Brunch Cocktail Recipe for Later! 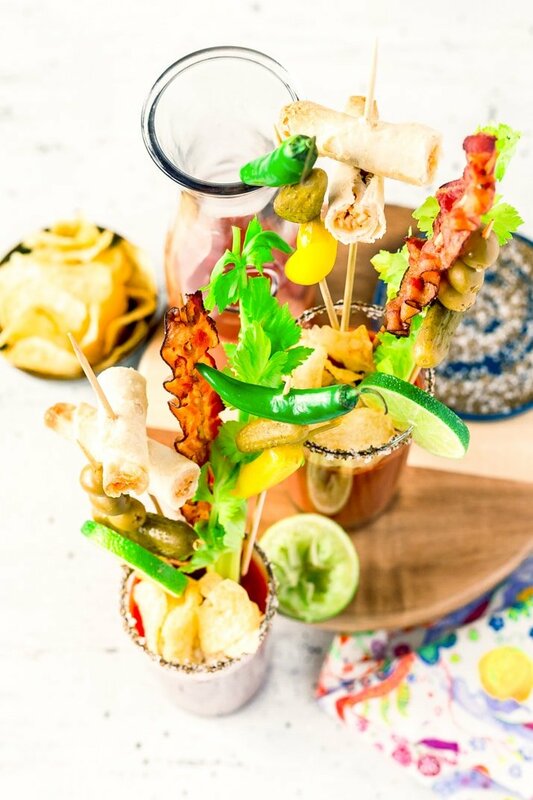 Bloody Maria: Swap out the vodka for tequila. Bloody Molly: Swap out the vodka for Irish whiskey. 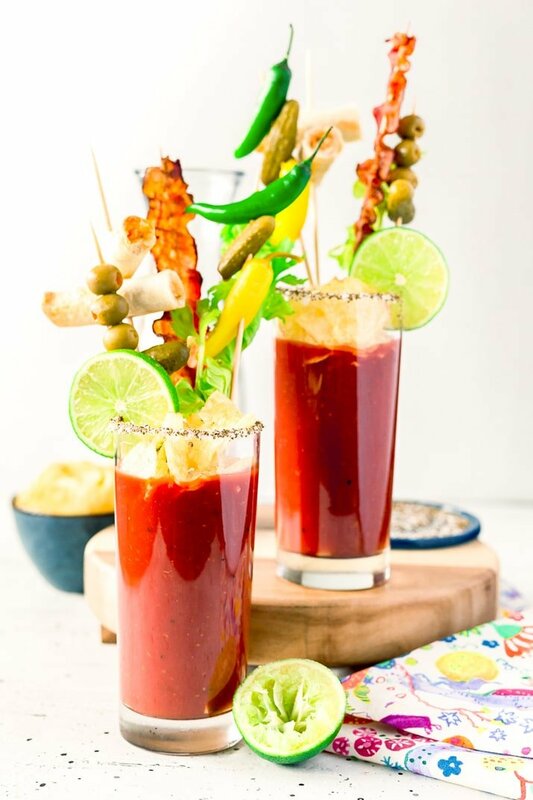 Bloody Ceasar: Swap tomato juice with Clamato juice. Bloody Geisha: Swap out vodka for sake. Bloody Pirate: Swap out vodka for spiced rum. Virgin Mary: Replace vodka with additional tomato juice. Combine the vodka and sliced jalapenos and set aside to steep. Combine the tomato juice, pickle juice, Worcestershire sauce, hot sauce, lime juice, and black pepper in a small pitcher and stir gently. Adjust seasoning as needed and place in the fridge until nice and cold. Oh my gosh, I love how you stuffed that blood mary with so many delicious treats!! Thanks, Sandi, a little over the top but so delicious! Wow. This is almost like a meal in itself. I bet the jalapeno doesn’t take many minutes to infuse its flavour with the vodka. Superb idea. I’m so glad you enjoyed it, John and the A1 and horseradish sound like great additions!